First Light Technologies, Inc. can provide lamp bases customized with your logo, product number, country of origin and/or reorder information. The single or multi color onlay is bonded to the ceramic base with an intense heat process that fuses the pigment to the ceramic base. This process provides durable and clear labeling making an exceptional quality product presentation. 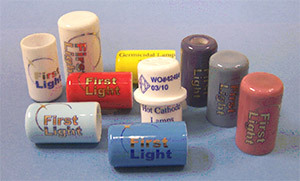 First Light Technologies, Inc. offers a complete selection of standard plastic and ceramic bases to meet your specifications. In addition to standard bases, First Light specializes in creating custom ceramic base designs supporting your proprietary equipment. In-house capability and capacity allow First Light to significantly reduce the lead-time from concept to production.